You could have bowled me over with a feather today. It was so incredibly warm outside. The first day we've have over 60 degrees this year, and I swear I heard a robin yesterday too. Because it was so warm I took my run outside today and when I returned I noticed that my crocuses were already blooming. What a great surprise! Last winter was so cold that nothing bloomed for another month. And I did get in a nice stretch of studio time last weekend﻿. I know I've been threatening to show some new encaustic work for awhile now but it is soooo close. Really. What a beautiful photo! 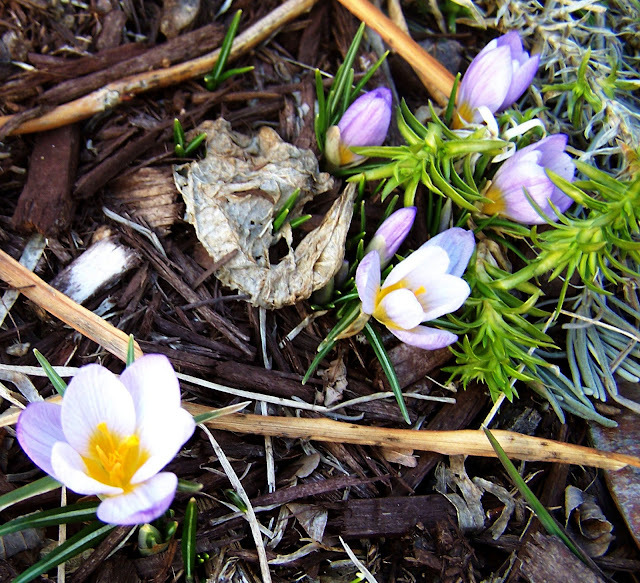 Signs of spring are always so exciting aren't they? I'm just waiting for the first leaves to turn on my side of the world. Can't wait to see more of your paintings! I am a high school art teacher looking to share more of my own art work. Finding the time to do it has always been a struggle and I'm hoping this blog will keep me on my toes.